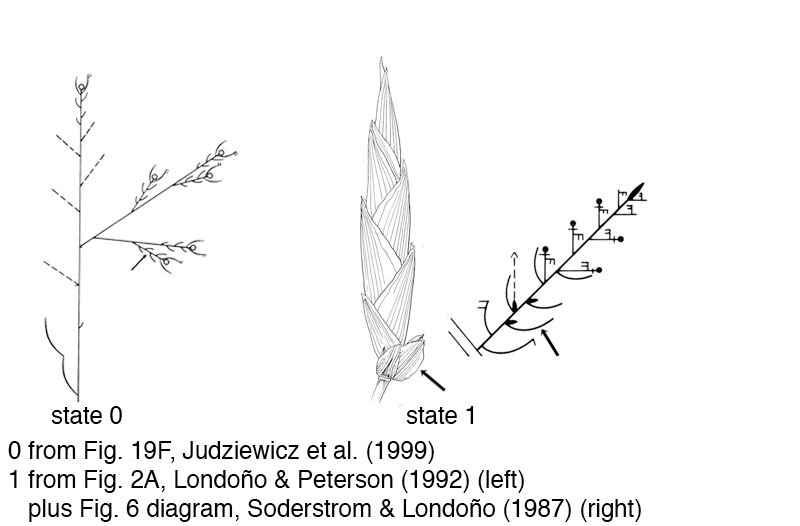 Stapleton (1997) and others have interpreted the spikelet (i.e., little spike) as representing the basic inflorescence type within the grass family; this interpretation is accepted here. 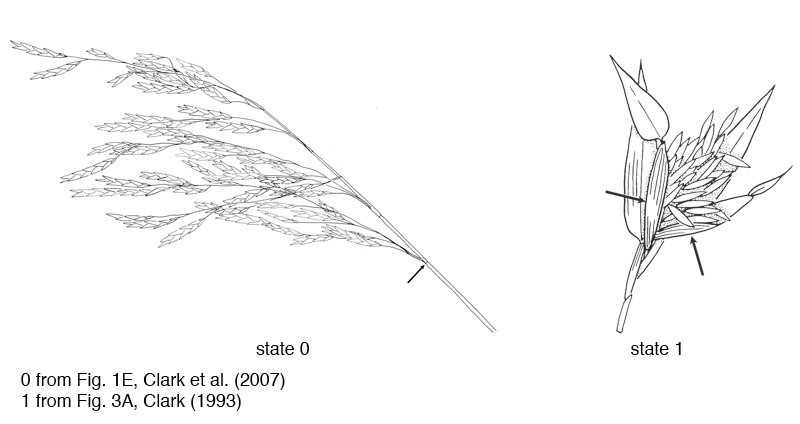 This means that an aggregation of spikelets becomes a compound structure, which we refer to as the synflorescence. Synflorescences in grasses are traditionally described as spikes, racemes, or panicles or some variation on one of these themes. It should be noted, however, that in addition to the compound nature of grass synflorescences, they mature in a determinate pattern so that grasses, including bamboos, do not have true spikes, racemes, or panicles, except for the spikelets themselves, which are bracteate spikes. 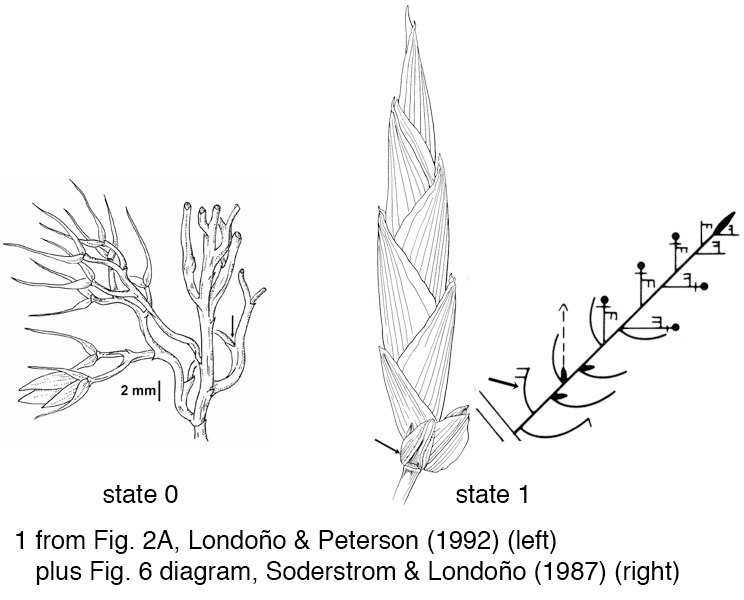 In bamboos, there is also the additional challenge of interpreting the pseudospikelet, which contains bud-bearing (gemmiparous) bracts that usually continue to develop additional orders of pseudospikelets but in a cymose fashion. 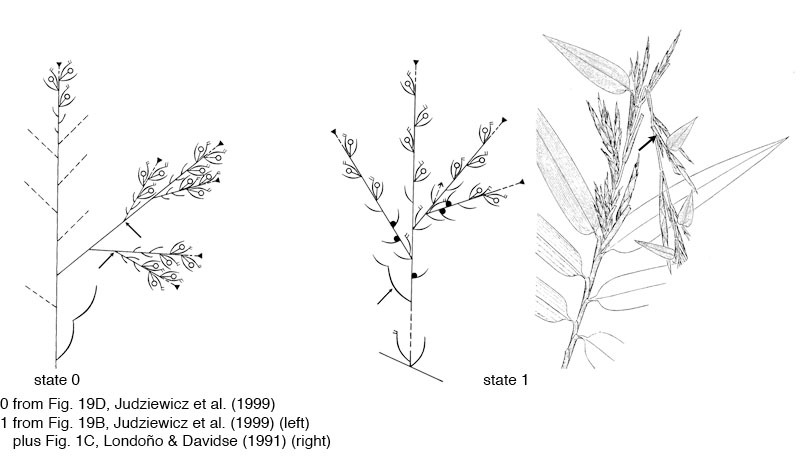 Inferring homology among the synflorescences of bamboos must await a deeper understanding of bamboo evolution derived from other sources of data, so the characters in this section are focused primarily on structures that differentiate spikelets and pseudospikelets. S-1. One or more gemmiparous bracts subtending the spikelet proper: 0 = absent; 1 = present, buds developing subsequently or not. S-2. 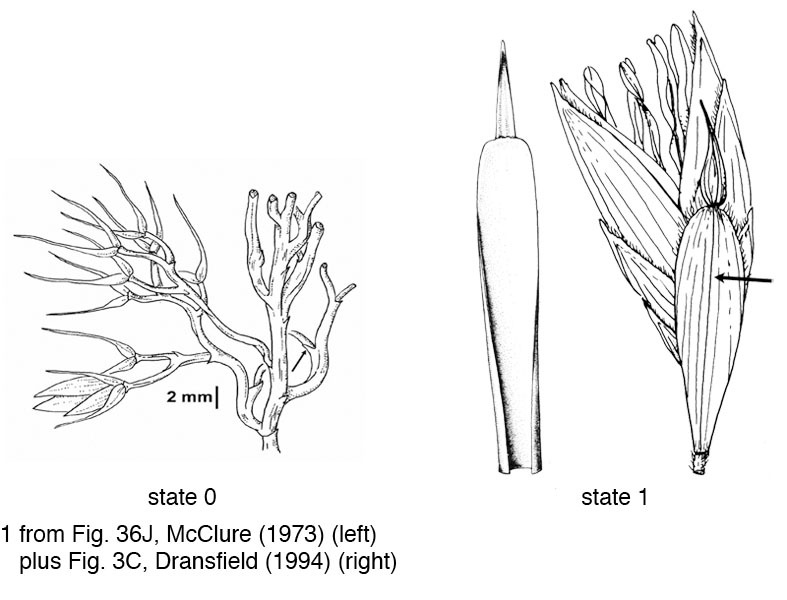 Subtending bract at the base of the axis bearing the spikelet or spikelet proper: 0 = absent; 1 = present. S-3. Subtending bract morphology: 0 = scalelike or present as a scar or rim, no more than a few mm long, blade absent; 1 = well developed with both a sheath and a blade (this often modified). S-4. 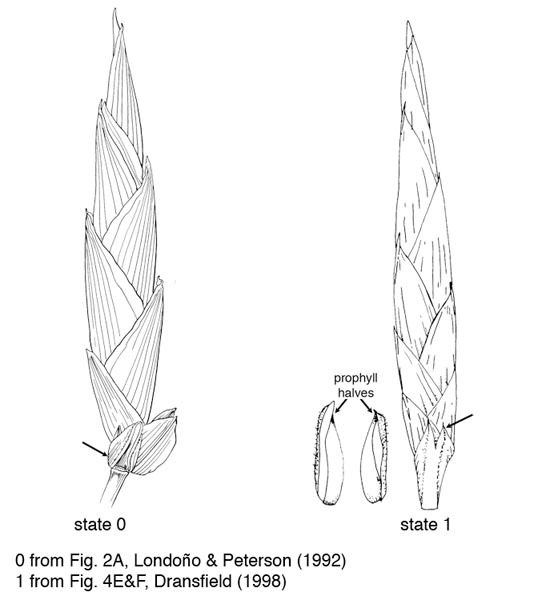 Prophyll at the base of the axis bearing the spikelet or spikelet proper: 0 = absent; 1 = present. S-5. Prophylls: 0 = whole; 1 = at least some deeply cleft to split lengthwise into two halves. S-6. One or more spatheate bracts associated with clusters of spikelets or spikelets proper: 0 = absent; 1 = present.